Irish Portrait Painter, Printmaker, 18th Century Artist, Biography and Paintings. One of the top Irish artists of the eighteenth century, the painter Thomas Frye was an Irish portrait artist, working in oils. He was also renowned for his printmaking, especially for his outstanding series of mezzotint studies. Despite a lack of written records, art historians believe he was the second son of John Fry, living in Edenderry, County Offaly. No one knows what artistic training Frye received, nor where it occurred. His earliest signed works emerge from 1732 onwards, and show the influence of his older contemporaries - the Tipperary portrait painter James Latham (1696-1747) and the semi-Rococo artist Stephen Slaughter (1697-1765). By 1735, Frye had settled in London and the quality of his painting can be judged from the fact that in 1736 he was commissioned by the Saddler's Company to execute a portrait of their Perpetual Master, Frederick The Prince of Wales. 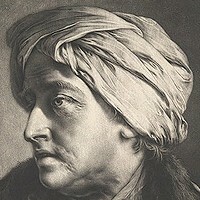 This work was later destroyed and is known to us only because of a mezzotint: a printmaking technique used at the time to replicate portraits. In fact, Frye's paintings (of which less than 90 survive) are less well known than his mezzotints. As a portraitist, his full-length portraits are less accomplished than his half and three-quarter scale works, and his interpretation of his sitters gradually became more realistic and insightful. He also worked in pastels, and completed a number of miniature oils. In 1744, Frye helped to establish the Bow porcelain factory in East London, where he took up the post of works manager until 1759, when he retired due to the effects of consumption. Remaining in London, he completed two highly original series of mezzotints: including 12 prints of life-size heads (eight men, four women), together with 6 prints entitled "Ladies Elegantly Attired in the Fashions". The outstanding quality and popularity of his works exerted a notable influence on other artists like Joseph Wright of Derby (1734-97). Frye passed away from consumption at the age of 52.  For the evolution of Irish painting and printmaking, see History of Irish Art.  For more about arts & crafts in Ireland, see: Irish Art Guide.  For a summary of fine art in Ireland, see Irish Painting.